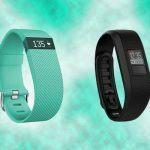 In this article we compare the Jawbone UP and UP24 fitness trackers. 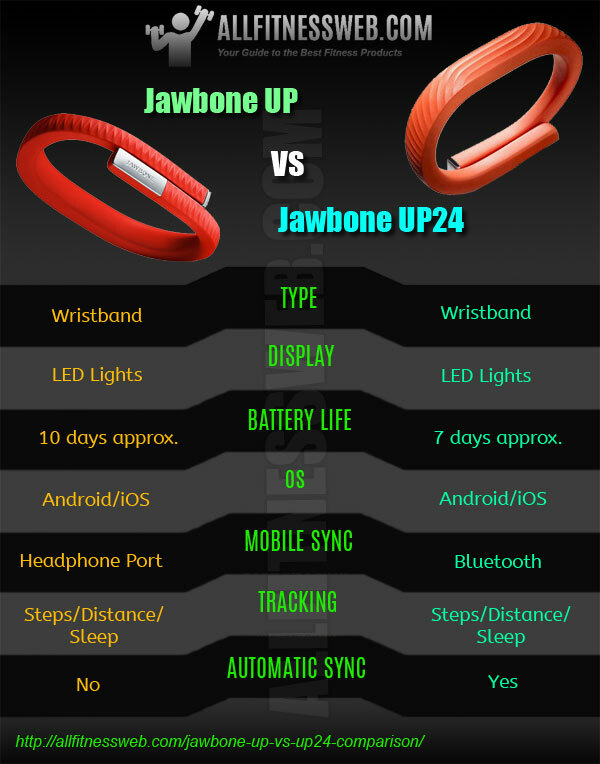 We have also compared the Jawbone UP3 with UP4 which were released later by Jawbone. 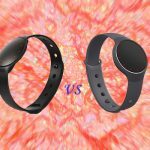 Both bands look similar when you hold them up against each other but there is one major difference in functionality which you will find out here. Charge Time 1.5 hrs approx. 1.5 hrs approx. 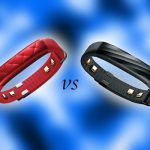 Jawbone UP from the outside is a textured rubbery bracelet available in a bunch of different colors and tracks your every move. Like most other activity tracker bands you can use Jawbone UP to track three things. 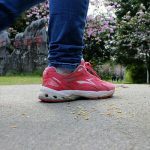 The first is your activity – it measures your steps throughout the day and tracks them against a goal, which you set for yourself (Ten thousand steps by default). Secondly, it tracks your sleep, i.e. 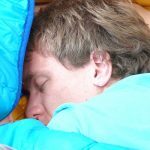 how much you slept, how much of it was deep sleep and how much you woke up during the night. The third thing that you can track is what you eat which requires effort on your part. For every cup of coffee or a glass of water or a snack you eat, you have to go and find exactly the thing you had and input information in the mobile app. 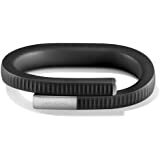 Jawbone UP24 is a little band that fits snugly on your wrist. The original UP model had to be synched by plugging it into the headphone jack of your phone. Now being able to sync wirelessly with just a click of a button is one of the most convenient features of UP24. 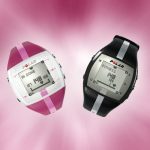 Both UP and UP24 do not have GPS or heart rate monitoring functionality. 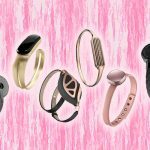 Alternatively, you can opt for wearable devices with built-in heart rate trackers. 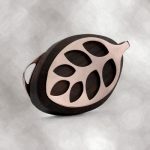 First of all they are very similar in design and are made up of same materials (hypoallergenic TPU rubber). 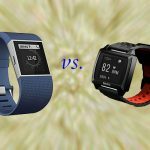 Both are worn on your wrist and track your daily activities. Both have LED lights as a status display. Both track your activity, inactivity, calories burned, distance travelled, mood, sleep quality / time and steps taken. 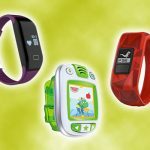 Both trackers have smart alarm, stopwatch, reminders and barcode scanner functionality. Both are compatible with iOS and Android devices. Both are water / splash resistant but not water proof. You cannot wear these devices under water. 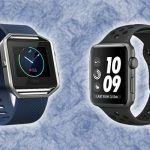 You need to physically plug in Jawbone UP to your Smartphone to synchronize data whereas UP 24 can wirelessly transfer your data using a Bluetooth connection. You can get push notifications and your activity status with Jawbone UP 24 on the go. With UP you need to connect the band to your phone to get any feedback on your progress. With Jawbone UP 24 you can simply give commands to your band through the app. 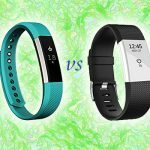 You can switch to different modes (sleep, power nap or workout mode) using the app instead of tapping the buttons on the band itself using wireless Bluetooth technology. You need not remember the tap combinations. As soon as you open the app in your Smartphone, Jawbone UP 24 instantly syncs with your phone and you get your activity progress immediately. With UP you need to remove the band and plug in your device to update the Smartphone app which is a longer process. Similarly with UP 24 you get to know your sleep tracking data immediately as you wake up and disable the sleep mode. The app receives an instant update of your sleep statistics for the previous night. With UP you will need to remove the band and plug in. With UP 24 you can set reminders to go off at any time. The device vibrates and the app gives you a notification instantly. UP has a higher battery life of about 10 days compared to UP 24’s which lasts about 7 days on a single charge. 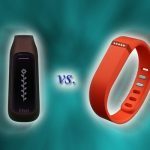 You can set your daily fitness goals using the Jawbone UP 24 app whereas the app for Jawbone UP does not have such a feature. The original Jawbone UP is available in four colors – Onyx, mint green, light grey and blue. With UP 24 you have two color choices – Onyx and Orange. The package contains the activity band and a USB charger cable. The UP app is free to download. 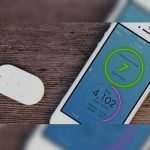 This fitness-tracking device manually tracks your sleep cycles where you need to synchronize your device with your phone every morning. It plugs in the headphone port on your iPad/tablet or Smartphone. 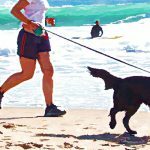 Jawbone Up is not recommended to be worn while swimming. 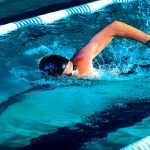 You can however ‘log’ your swimming workout in the app manually to calculate your calories burned. 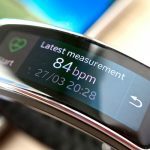 This band does not have a GPS or a heart/pulse rate sensor. It tracks your steps using the arm movement. You can wear it on your ankle while you are using the treadmill. The smart alarm is in the form of small vibrations. If you use MyFitnessPal (https://www.myfitnesspal.com), then you can synchronize data with the UP app. Before purchasing measure your wrist size and use the size chart to select the right size. This device is not Bluetooth compatible. 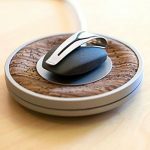 Instead, it uses earphone port to communicate with your Smartphone or tablet or iPod. 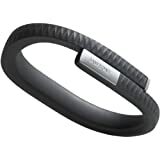 Jawbone UP24 uses Bluetooth Low energy (BLE) protocol to communicate with tablet / smart phones. It may not work with old Android phones which do not support Bluetooth LE. USB charging cable is included in the package. Use the size chart to select the correct size for your wrist before ordering. It is not to be used while swimming as it is not waterproof. Log your swimming activity manually in the phone app. 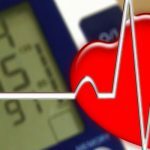 No GPS or heart rate monitoring present. It automatically updates your activity data when your phone is in range. 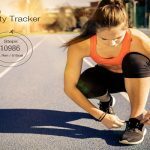 This device tracks your steps when running or walking. You can time any other sport activity using the stopwatch and enter the details in the app later to calculate calories consumed. Vibration smart alarm wakes you up during ‘light sleep’ phase. You may wear this band on your ankle when using a treadmill or an elliptical. Before doing that, you should ensure that it fits your ankle.